The period of turmoil in Punjab in the 1980s and early 1990s damaged Punjabi cinema severely. The industry was revived in 2002 with Jee Aayan Nu directed by Manmohan Singh. A huge success to the film brought a new life to dying Punjabi cinema. As a result, 24 films were released only in 2012; whereas the number of releases surged to 42 in the 2013. Meanwhile, the Punjabi film industry seems to have become one of the most lucrative film industries in India. Mainstream Punjabi cinema has been superficially serving the sole agenda. What Punjabi films have been doing is making comedy and romantic films or imitating Hindi films. Triteness in the themes of Punjabi films and lack of aesthetic ability is reaching an alarming situation once again. Prior to this, Punjabi cinema already experienced a phase, when narratives only revolved around the Jatt community. ‘Jatt’ titles were the unique selling point in Punjabi films in the 1980s and the 1990s. These films showed severe fights among the community members on trivial issues rather than exploring the real issues, the community has been facing. Since the inception of Punjabi cinema with Pind Di Kuri (1936), it has gone through various such phases. It wouldn’t be an exaggeration to term the 1970s as decade of religious Punjabi films. Many Punjabi releases had religious themes like Nanak Dukhiya Sab Sansar (1970), Man Jeete Jag Jeet (1972), Bhagat Dhanna Jatt (1974) and many more. Films invoking the popular and traditional culture, socio-political environment, historical incidents or folk tales and other issues associated directly or indirectly with Punjabis, have been facing a major downfall. A small minority of this genre has managed boxoffice success. The audience for this genre has been shrinking drastically in the region despite being critically acclaimed on the national as well as international arena. Such films are often marginalised by the producers, financers and promoters, too, in Punjab. The films in 2014, like Jatt James Bond has been improved technically and artistically perhaps with the arrival of Bollywood big-shots like Yashpal Sharma, Zarine Khan and Rohit Yugraj Chauhan (director). Rural Punjab has been playing a vital role in the storyline and has managed pull the crowed to multiplexes. Nevertheless, the film has failed to expose the genuine issues that rural Punjab is facing. 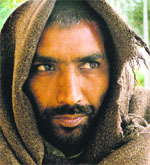 The National Award-winning film Marhi Da Deeva (1989), produced by the NFDC, mercilessly explores the issues of economic inequality, social segregation and sordid life of landless farm labourers (seeri) and other landless communities in Punjab and gives an insight to a Punjabi, particularly Malwai, village milieu. Directed by Surinder Singh, the film was adapted from Punjabi novelist Gurdial Singh’s novel by the same name, written in 1969, later translated into English as The Last Flicker. Caste-based segregation and economic inequality is questioned quite rationally by protagonist Jagseer (Raj Babbar), who is forced give up the land, his ancestors have been cultivating since long. On the other hand, Ronkee’s (Pankaj Kapoor) holds God responsible for such a discrimination against them for being lower caste and scathingly argues with God for his poor state of affairs and exploitation by the landlords in village. The title Marhi Da Deeva, Lamp of the Tomb, itself contains a unique cultural assumption that a lamp must be lighted at the tomb of deceased ancestors on certain occasions by the descendants of the clan, implying that ancestors are still being remembered. The first Indian-Punjabi film, screened at numerous international film festivals and gained critical acclaim and awards, apart from winning three National Awards, Gurvinder Singh’s directorial debut Anhey Ghore da Daan aka Alms of Blind Horse (2011), based on Gurdial Singh’s novel of same name, diligently puts across the distressed and frustrated life-cycle of marginalised Dalits in Punjab. It, too, was produced by the the NFDC. However, the film convincingly depicts the angst and resentment of the working class with minimal dialogues and silence, often dominated by natural sounds. On the other hand, the futile struggle against growing vacuum between upper caste landlord and landless lower castes is an innermost idea of the film that makes the narrative a melancholy. The film addresses many hardships being faced by lower caste people on a daily basis in Punjab. Another aspect the film brings to the fore is the quality of life of such people is not better at all in urban areas too. The darkest chapter of the recent history of Punjab was of the Sikh separatist movement or the Khalistan movement and its aftermath. It was the time when bloodshed of innocent civilians and human rights violation like extra-judicial killings and brutal torture of innocents by the police in the state was at its peak. Manoj Punj’s National Award-winning, Des Hoyaa Pardes (2004); claimed to be based on true incident; paints a very cruel picture of the 1980s and the early 1990s Punjab and raises numerous questions that are still unanswered about the way the system has been working. The film was produced by Sai Productions. In the film, the protagonist, Gurshaan Singh Soman (Gurdas Maan) is illegally picked up by the police spearheaded by an unethical police officer, who is more concerned about accomplishing the quota of deaths of terrorists, allocated to him by the government and senior officers. Intimidated by the consequences, Gurshaan’s parent insist that he migrates to the US legally or illegally and seeks political asylum with his friend’s help. A sizeable number of the Sikh community sought political asylum in western countries like US, Canada, Germany, UK, Austria and other parts of Europe during this period. The issue of human trafficking and obsession of Punjabi youth to migrate to western countries by hook or by crook has always featured in newspapers throughout the world. In order to make this dream come true, they do not shrink back from putting their valuable assets i.e. property and home at stake, and often get duped by fake travel agents. Addressing the same issue, Nabar (2012-13), has grabbed a National Award for the best feature film in Punjabi. Nabar which means "a rebel" was directed by Rajiv Kumar and produced by UK-based Jasbir Singh Derewal. The NFDC presented Shaheed-e- Mohabbat (1999) with Sai Productions. It depicts the real love story of Buta Singh (Gurdas Maan), a retired Sikh Army man and his Muslim wife Zainab (Divya Dutta) , whom he rescues from riots that took place following the Partition in 1947 and later on gets married to her. Besides winning the National Award, it travelled to many national and international film festivals. They are forced to get separated in 1952, in spite of having a child (daughter), when governments of India and Pakistan decide to reunite all such women, who were left behind in 1947, with their families. The film raises serious questions on the wisdom authorities of both of the countries for taking such an absurd decision. The Sufi saint of the 18th century and legendary Punjabi poet, Waris Shah has been beautifully represented while he was writing a classical poetic love story called Heer in Waris Shah – Ishaq Da Waaris (2006). Directed by Manoj Punj and produced by Sai Productions, the film has got critical acclaim at nation and international platforms. Apart from accomplishing many National Awards, it had entered the 79th Academy awards and leading actor in the film, Gurdas Maan got the best actor award at the Berlin Asia Pacific Film Festival. Meanwhile, the short film genre has made a marvellous entry in Punjab. The self-funded films of this genre are based upon Punjabi literature that depicts issue that have been prevalent in Punjab at some point of time. Navtej Sandhu’s directorial Nooran (2014), based on famous Punjabi author, Balwant Gargi’s story Rabbo Marasan has been selected for Cannes Film Festival Short Film Corner which represents a woman’s emotions. Apart from this, Punjabi lyricist Amardeep Gill’s Sutta Naag (2014), adapted from Sahitya Akademi Award winner Punjabi witter, Late Ram Sarup Ankhi’s short story of same name. The narrative portrays 50 years old Punjab and addresses serious subjects like infidelity and the suppression of women. A low- budget film has been premiered at International Punjabi Film Festival Toronto.